1x Waterslide Decal sheet, Instructions. x Per set. A truly memorable Tiger Meet scheme. Quality decals printed by Cartograf. 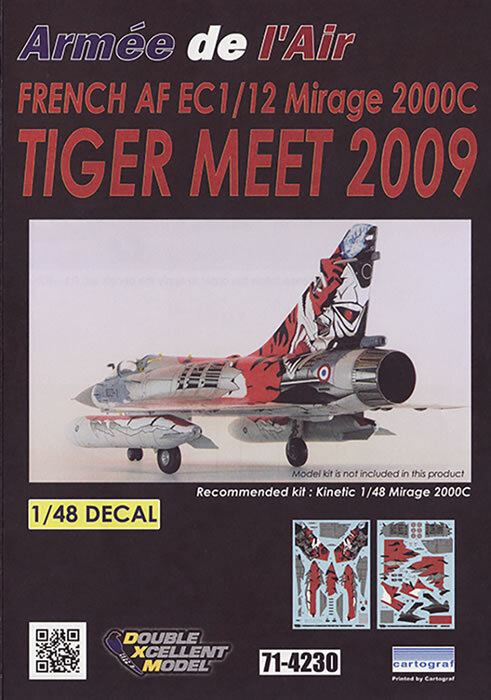 For the lovers of Tiger Meet aircraft, this is one of the must have decal schemes, especially for the Mirages. NATO Tiger Meet of 2009 was held with the host country being Belgium. It was hosted by the 31 smd at the Kleine Brogel Airfield from the 14th to 25th September, 2009. It was at this meet that the aircraft of EC1/12 of the French Air Force flying Mirage 2000C’s and B’s took out the prestigious Silver Trophy for the competition. 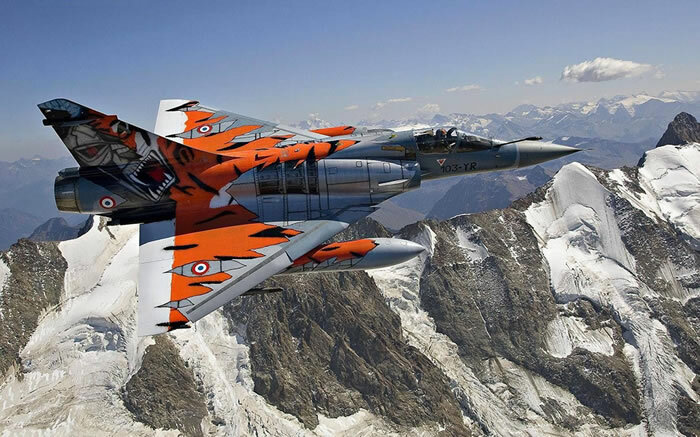 This decal set, produced by DXM, who have previously released some really interesting schemes, especially for Japanese Defence Force anniversary schemes, is a captivatingly bright and out there scheme for the French Mirage. The decals are printed by Cartograf, so you know they are of the best quality and will ultimately go down well on your model. There are 2 A5 sheets of decals for the one aircraft which is 103-YR EC1/12 of the French Air Force. Detail is crisp and appear to be in perfect register. Many of the decals are quite large and will need care in their placement to ensure minimum moving to reduce the risk of tearing. What my scans do not adequately show, but the photos above do a bit more, it that the base of the decals are all metallic, which contrasts brilliantly with the mainly orange and black tiger scheme. The instructions have most adequate detail on them, with colour call outs for Gunze Mr Color, Humbrol and where possible FS Standards numbers. The decals are sized for the Kinetic kit but I’m sure they will fit on the Italeri kit as well. 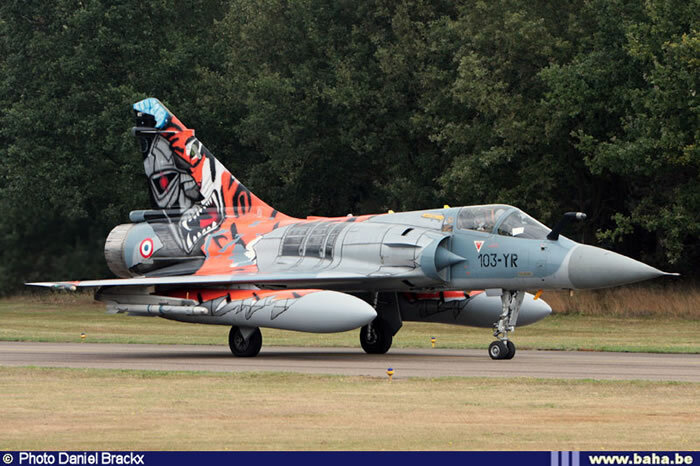 As a builder of Tiger Meet aircraft, I can’t wait to build a Kinetic Mirage 2000C so I can use these decals. A top scheme with quality decals, what a combination. 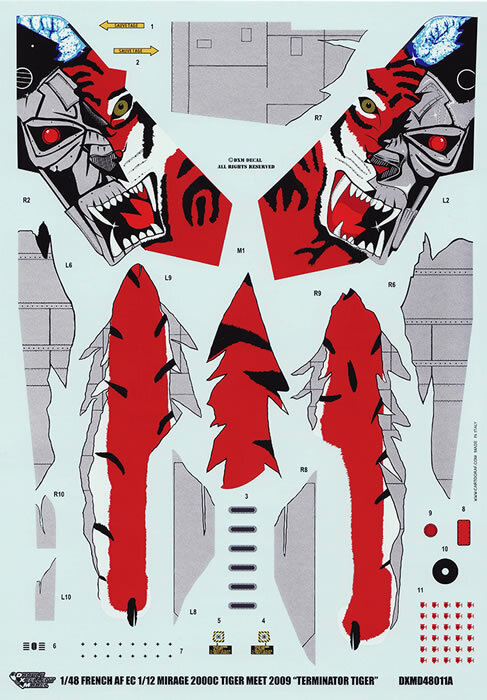 Well done DXM on another stunning set of decals. Thanks to DXM for the samples.